Organized by age for easy reference, the dozens of creative activities in Everyday Play are inexpensive, require few or no materials, and are easy to do with your child. Best of all, they give you and your child great ways to have fun while laying the foundation for important fine motor skills that your child needs for school. Holding a pencil, drawing a line, zipping a coat—Everyday Play helps your child accomplish all these milestones and more. 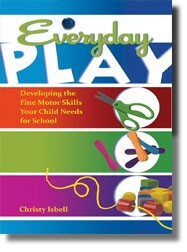 With a chapter of frequently asked questions from real parents, developmental guidelines, and easy strategies for teaching your child important skills, Everyday Play is the book you need to ensure your child is ready for school.